Mark Cavendish (Omega Pharma-Quick Step) punched through to his first victory of 2014 on Sunday to remind everyone he’s not forgotten how to win. 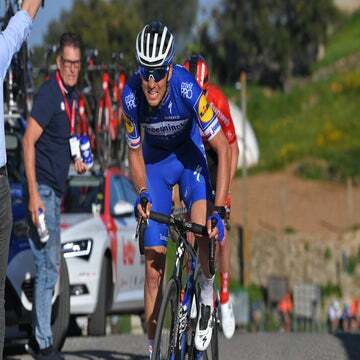 After some misfires in early races, including being blanked at the Dubai Tour earlier this month while archrival Marcel Kittel (Giant-Shimano) collected three wins, Cavendish and his new-look leadout train got it right in the final stage at the five-day Volta ao Algarve. With a solid setup from Alessandro Petacchi, Cavendish easily kicked ahead of Arnaud Demare (FDJ) to open his account for 2014. Rivals such as Kittel, Sacha Modolo (Lampre-Merida), and André Greipel (Lotto-Belisol) have been scooping up victories in the early races, with Greipel already notching six wins in 2014. But Cavendish has been slower out of the gates. He didn’t contest the sprints in his season debut at the Tour de San Luís and misfired in the Dubai Tour as Kittel won all three sprint stages. Cavendish’s first win of the season came on the same day as teammate Michal Kwiatkowski sewed up the overall, securing the team victory in the Portuguese race for the second consecutive year. Cavendish said he remains unsure about his racing schedule in the coming months, insisting that he wants to race less and arrive fresher for the Tour in July, where he will have huge pressure and high expectations of sprinting for the yellow jersey in the opening stage. Kwiatkowski, meanwhile, wrapped up the first stage race overall title of his promising young career. 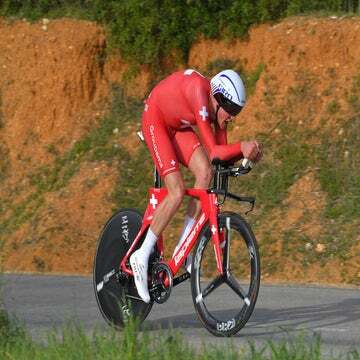 The 23-year-old won two stages, including a time trial, and then held off attacks from Alberto Contador (Tinkoff-Saxo) to defend his leader’s jersey Saturday. Kwiatkowski, who already won a race during the Mallorca Challenge earlier this month, will prepare for his next races at Strade Bianche and Tirreno-Adriatico.